Like your Instagram photos? Then why not put that as your Facebook cover photo? But the limited tools on your computer is not going to cut it. 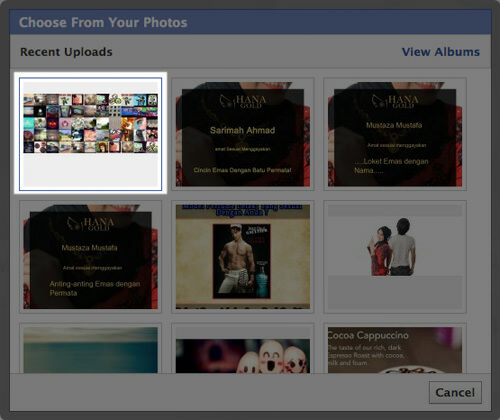 It’s easy to set a single photo as your Facebook cover photo, but not if you want to customize sets of photos. Yes, I’m talking about putting up a gallery of Instagram photos as your Facebook Cover Photo. How? Use Insta Cover. Insta Cover allows you to select a gallery of Instagram photos and turn your Facebook cover into a gallery of beautiful photos instantly. Let’s get started. 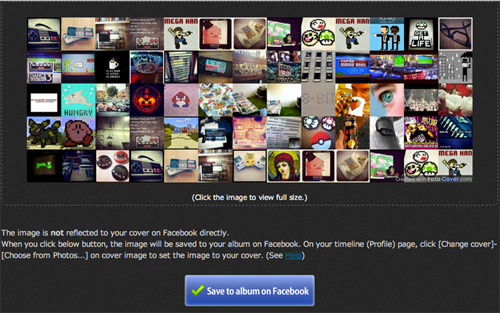 Firstly, you need to create your new Facebook Cover photo from your Instagram collection. 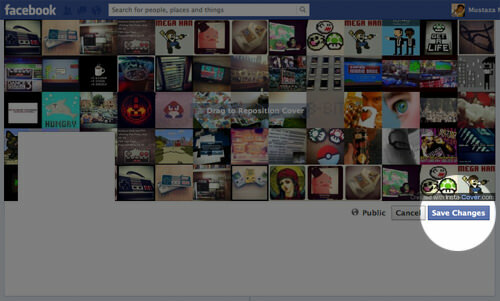 To start creating, go to Insta Cover homepage and click on the button Sign In With Facebook. Click on the button Go to App to allow Facebook integration with Insta Cover. Now you will be redirected to the photo preference page. Set the Target Photos or Photos You Liked based on your Instagram user ID, or select Category or Tag to get a photo collection without providing your Instagram ID. You can then set the order of the photos, layout type, rounded corner and spacing too. After setting all that is necessary, click on Preview. 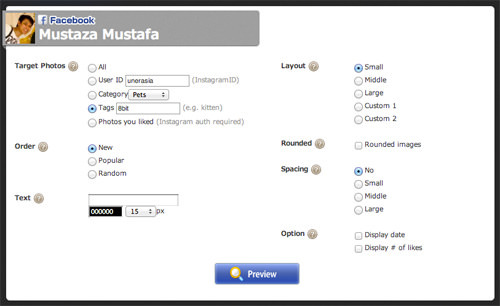 In the preview window, you will see photos from Instagram based on the preferences you have set earlier. You will see an X button on each photo. Simply click to change any single image, or click on the ‘refresh‘ button at the top right to change all images at once. When satisfied, click on Final Preview. 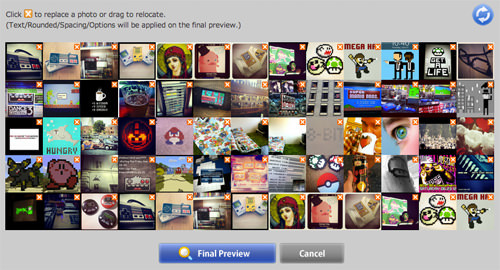 In the final preview, you will see your new Facebook Cover photo. If you like the final result, click on Save to album on Facebook. Now that your new Cover Photo is ready, go to your Facebook Timeline. 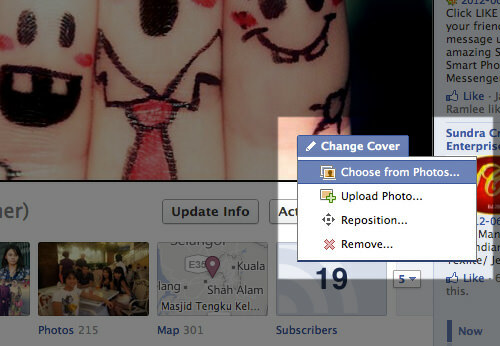 Hover your cursor over your current Cover Photo, click on Change Cover > Choose from Photos. Your photo selector will appear, and you will see the cover image you created from Insta Cover already uploaded, select that image. Insta Cover had the cover photo created following the standard size of 851 x 315 pixels so you don’t have to adjust the placement. Click on Save Changes. That’s it! 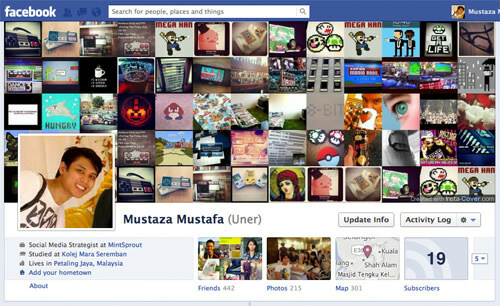 Now you have your new Facebook Cover Photo based on an Instagram photo collection. 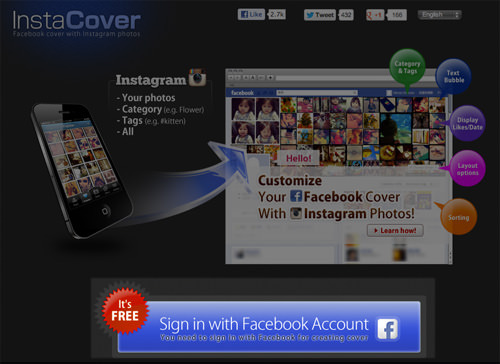 Beautiful, now you can always change your cover photo with beautiful photos from millions of Instagram collections. Like this FB Timeline-enhancing feature? There is also another app to add Twitter stream to your Facebook Timeline. What are other apps do you use to customize your Facebook? Share it with us. Let us know in the comment.